A new product on the market to clear your sinuses is the Naväge Nose Cleaner. Unlike Neti Pots and other nasal irrigation systems, the Naväge washes and moisturizes the inside of your nose with a gentle powered suction to pull the saline through the nasal cavity. Many countries already recommend nasal hygiene as a standard of care. Keeping your nasal passages clear and moist is an important factor in preventing nasal inflammation and irritation. Nasal irrigation helps treat sinus congestion and stuffiness that results from any number of causes, including allergies and colds. Naväge flushes out everything like dust, pollution, and pollen, and even dried encrustations. Using Naväge will give you a cleaner nose, which will help you breathe better after each use. Like a Neti Pot or other irrigation systems, Naväge sends a saline rinse through one nostril, where it flows to the back of the nasal cavity and makes a u-turn at the gap between the nasal septum and rear nasal wall. The saline then travels back to the front and out the other nostril. The saline, or SaltPod capsule, consists of salt and water. Naväge uses purified pharmaceutical grade sea salt that contains over 99.99% sodium chloride. Naväge water goes through a purification process consisting of carbon filtration, double deionization, UV sterilization, and sub-micron finishing filter. Each SaltPod is mixed with 8 oz. of water to create the perfect mixture of salt and water to prevent any nasal burning or stinging. Naväge is the world’s only nasal irrigator with gentle powered suction. Naväge SaltPods are Nature's Decongestant - fast, drug-free relief from sinus congestion. ​Clinically proven to relieve congestion due to allergies, sinusitis, hay fever, common cold, dry air, pollution, etc. ​Helps relieve snoring and improve sleep. Breathe better now, breathe better forever! Naväge suggests you irrigate your sinuses twice a day, but is safe enough to use more frequently. And for those who are hesitant about using the system, it is not as difficult as you think and the clean feeling you get afterwards will win you over quickly. 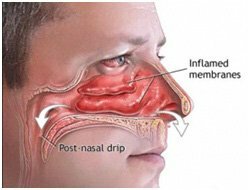 Nasal congestion and sinus occurs when nasal and adjacent tissues and blood vessels become swollen with excess fluid, causing that stuffy feeling. Nasal discharge or a runny nose does not always accompany the congestion. Congestion and nasal pressure can be caused by infections like cold, the flu, and sinusitis. Allergies and other irritants like tobacco smoke cause your nose to run. Some people have a runny nose for no apparent reason, called nonallergic rhinitis or vasomotor rhinitis. With any one of these issues, the membranes lining your nasal passages become inflamed and irritated. You begin to create more mucus to flush out the irritant, like pollen. Another, less common, cause of nasal congestion is caused by polyps or tumors. The main thing to focus on when you feel stuffy is keeping your nasal passages moist. Avoid drying them out, which will just irritate them more. You can use a humidifier, take a steam bath/shower, and drink lots of fluids to keep and get moisture in your nasal passages. Or you can use a nasal irrigation system, like the Naväge Nose Cleaner. The goal of any of these systems i to prevent your nasal passages from becoming so infected you require nasal surgery. Many people like to use nasal sprays. Nasal sprays are a great quick fix, but should not be used for more than 3-5 days in a row. Overusing nasal sprays causes a phenomenon called rebound nasal congestion, or rhinitis medicamentosa. Nasal spray contain chemicals that shrink congested blood vessels, opening up your clogged passages. After using every day for multiple days, your blood vessels don’t respond to the medication anymore. The best combat for rhinitis medicamentosa is nasal irrigation. You cannot overuse nasal irrigation. ​Push the power button halfway and the suction starts. Push it all the way for the drain valve to open and saline to flow out of the nose pillow. Check the suction with your finger. ​Slip nose pillows into your nostrils so the tips are not blocked and fit snugly. Adjust the stems to find a comfortable fit. Once cycle is initiated back off a little to increase flow. ​Relax, stand up straight with head erect and breathe through your mouth. ​The cycle is complete when the upper tank is empty. Release the power button and remove the pillow from your nostrils. ​Gently blow your nose to remove any excess saline. Twist off the bottom tank, empty, and clean the entire device. If you are shopping for a Naväge system, you can visit the Naväge website online store. Naväge has a 100% satisfaction guarantee return policy. Be sure to read the fine print, as there are circumstances Naväge will not refund. A smart shopping tip is to buy a bundle that includes multiple SaltPod packs and pay attention to the shipping and return policy. For other purchase options, use your web browser to search for Naväge as prices can vary depending on which store you go to. It’s not cheap to look for the lowest price on a product that is exactly the same as the higher priced version, especially if you are on a strict monthly budget.